Iran – Tehran 27 October 2012. 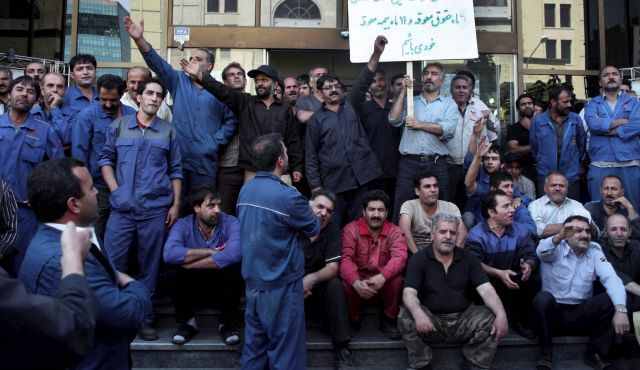 Through protest actions held in central Tehran, 600 metal workers employed by the government working at Factories Number 1 and 2 forced their employer, the government, to yield to their justified demands and pay in full all 5 months of their delayed backwages. This is a fantastic new victory for the proletariat of Iran and shows the way towards future victories. The Iranian Workers’ Free Union reports that today, Saturday 27 October at 9am Tehran time, workers of Factory No 2 held their first general assembly inside the factory to decide about how to conduct their activities regarding their demands and rights. In this meeting, four representatives were chosen to contact the management with regard to the retired workers’ wages and unpaid benefits. We wish the workers of the Factory No 2 continued success and congratulate them on holding their first general assembly. Towards the Iranian Proletariat’s United Front.